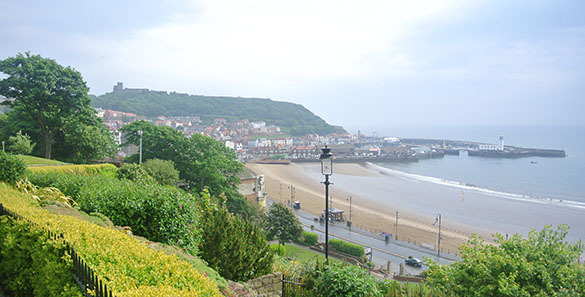 SCARBOROUGH, ENGLAND (June 4) — Wooster Geology’s Team Yorkshire has now arrived for ten days of fieldwork in the Jurassic of the Cleveland Basin exposed in and around this delightful English seaside town. It was a tedious journey for Geology Senior Independent Study students Meredith Mann (’16), Mae Kemsley (’16), as well as their aged advisor (that would be me), but we arrived on the right day in the right place. We had many plane and train problems in transit, and we had to stand during the last leg to Scarborough. Still, happy to be here and get to some excellent geology. We’re staying in a hotel atop a cliff very near the well-known Rotunda Museum and the Grand Hotel (which was notoriously shelled by the German Navy in 1914). Spectacular views of the bay, town and castle are nearby. Tomorrow our friend Paul Taylor of the Natural History Museum in London and Peter Rawson, retired from the University College London, meet us. We will then begin exploring localities.